I put the Black, White, & Red All Over quilt aside (for now), and started on a baby quilt. My friend is due the beginning of June, and she’ll likely deliver sooner, so I wanted to be sure and get this done quickly. 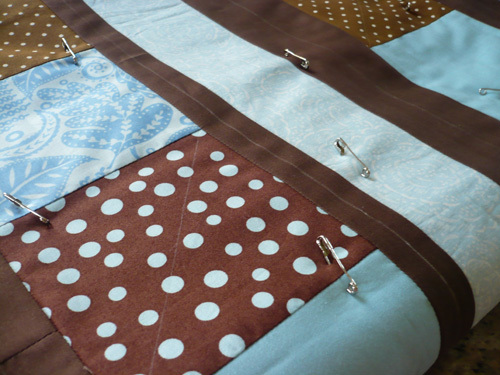 She requested a blue and brown quilt, and never haven worked with those colors before I was excited….I love that color combination!!!! I used the boy pattern of the Baby Mine pattern, and I got the whole thing pieced. It took me a few days to figure out how I wanted to quilt it. Usually quilts “speak” to me and tell me what what I should do, but not this time. Bah! I’ve never marked a quilt top for quilting before, but I tried it this time. I wanted to do some straight line kind of stuff. I’m still kind of on the fence about marking, and while I really like how some straight line quilting turns out, by and large I’m an all over meander quilting kind of gal. I’ll show pictures of the quilting soon.